I’ve been lurking for a while, and what really made me want to register is the “Boars Behaving Badly” thread. What a hoot! I have two Abyssinian boars myself, Elmer and Winston. They are brothers and have been together since birth, April 22, 2017. So far they lovely, lovable, and comical. And now for the sad backstory, because guinea pigs always seem to involve one. 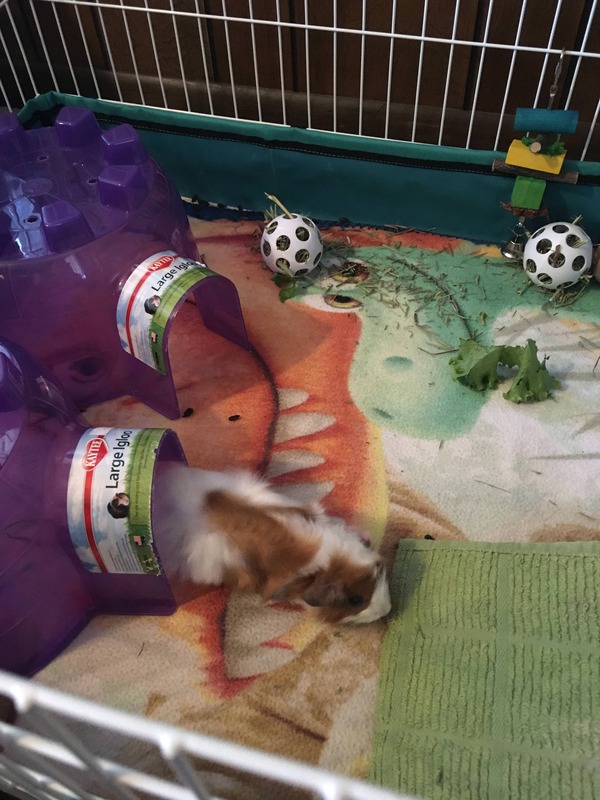 I had been wanting to get guinea pigs for my daughter, who turned 10 in April. She had a fancy rat named Ella who lived a good long life with her, and I felt it was time to bring another sort of small animal(s) into our home. 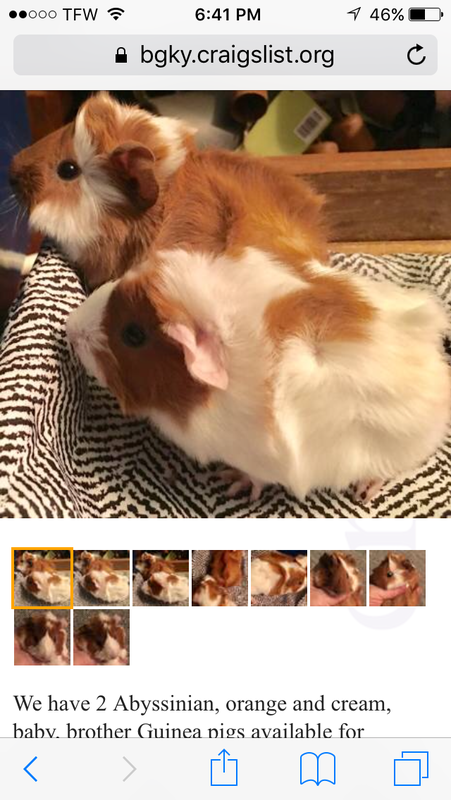 So, one day I was scrolling Facebook and saw a rehoming ad for baby guinea pigs. I messaged the woman, and she had one more baby left. Upon further conversation, I learned that this little pig was born with no eyes! She wasn’t lethal- she was tricolored. Who knows what was wrong. Nevertheless, I went and picked her up. At first, all was well. Then, one day I came home and found that she had miscarried two babies. Already pregnant. I piled all kinds of extra veggies and love on her, and made her a vet appointment that was about a week out. In the meantime, I had already found her a companion on Craig’s list, but the baby wasn’t ready to leave her mom yet. Sadly, Izzy didn’t make it to her vet appointment. 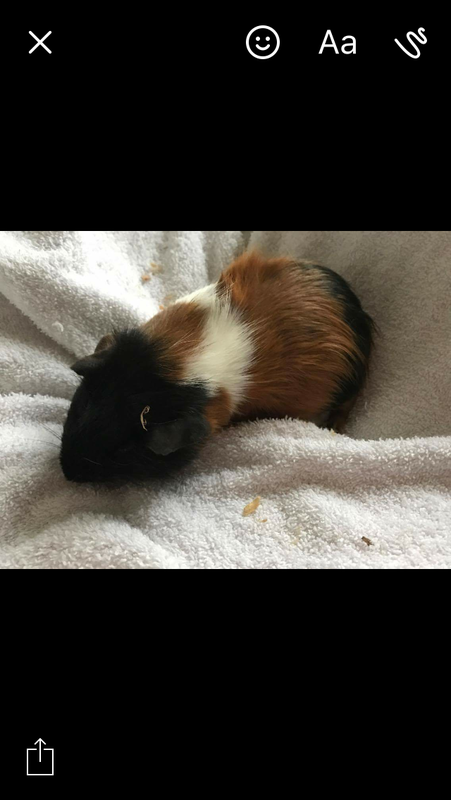 I strongly suspected that her parents had come from my local pet store, and who knows how many generations of inbreeding has been going on there (the local feed store where I buy my pellets told me that they “breed” them to sell while I was searching for a younger female guinea pig for Izzy). Anyway, after that experience, I decided that I still wanted to try. I contacted the person on. Craig’s list that had the young female (she was a Texel) and found that she had a pair of Abyssinian boar babies. 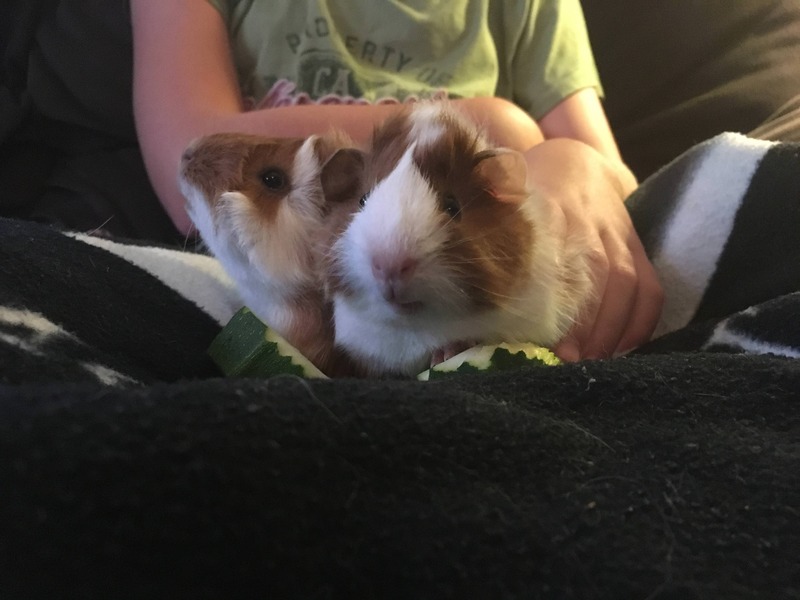 She told me that she shows Guinea Pigs, but these two boys weren’t quite show quality. Who cares, right? Also- she was two hours away from me, and that satisfied my desire to get far away from my LPS gene pool. So, that is how Elmer and Winston came to live with me. Izzy was a sweetheart, but she had a lot going against her. They have unlimited access to Timothy hay and get veggies and pellets everyday. 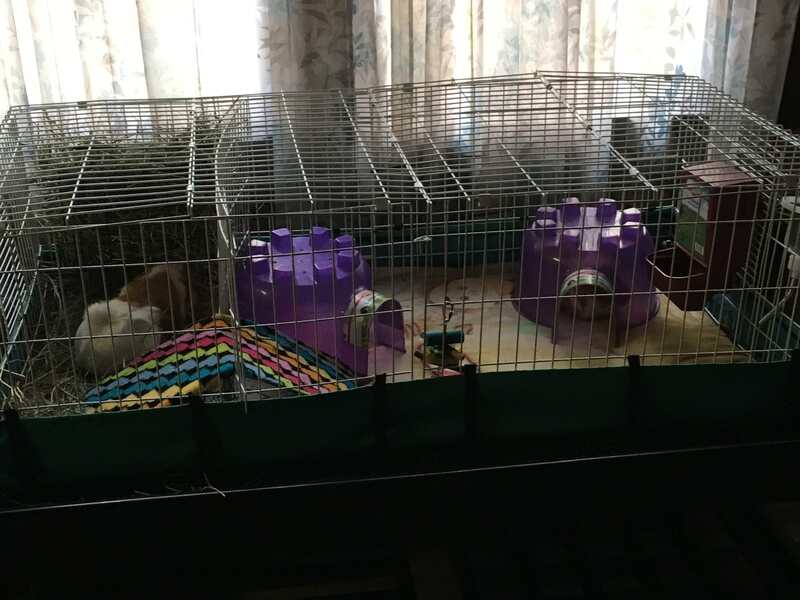 They wheek and chatter and rumble strut and popcorn. I love them! Do you have to have a photobucket account to post pictures? Sorry for the long introduction! One story is better than two. And go as big as you can. Life with boars is always better with more room. Not Photobucket, but some picture hosting site is necessary. Elmer is the mostly white pig, Winston is the mostly red pig. Elmer in the cage. 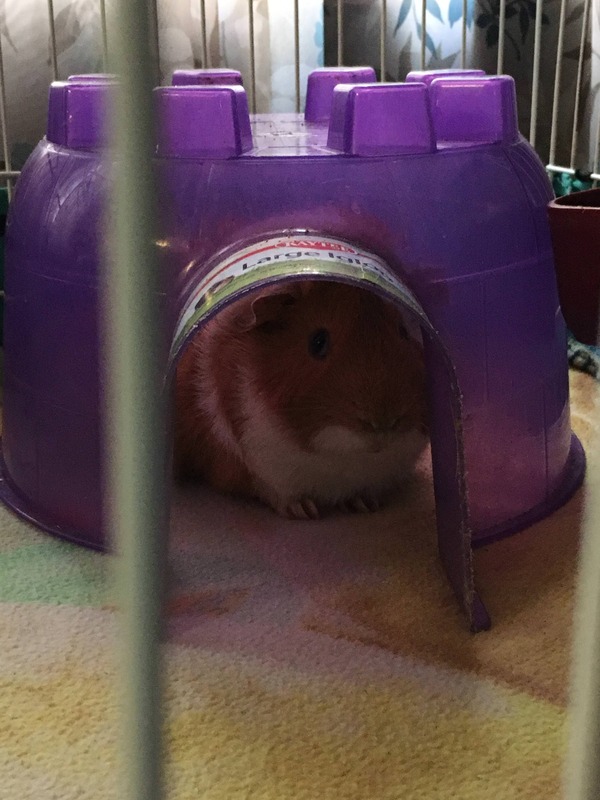 (Winston is very cautious and was in a pigloo). Aw, what cuties. I hope they have long and happy lives with you. Thanks everyone! I’m still experimenting with what to put under my fleece; right now I’m using puppy pee pads, but I’m thinking about switching to cotton towels. But the cage is too small and too crowded. Personally, I'd throw out the pigloos and replace them with something much smaller and with two doors. No hidey in a pig's cage should only have one door. And I'd get a bigger cage. Two pigs need a minimum of eight square feet, and larger is much better. Bpatters- I know, they have grown up FAST! I am shopping for a C&C cage and will have one soon. Any suggestions to replace the pigloos? Maybe a couple of fleece forests? They get along in a pretty fantastic way. I know the cage is small. Fleece forests are fine. Or take one pigloo out and cut a hole in the other one. Update- My boy's 2X5 C&C with a narrow loft has been shipped! I also ordered a set of fleece flippers and a kitchen. I'm so excited!! Does anyone know how I could make a fleece forest using a C&C lid? I could make a couple a half a grid wide, but I don't know if that would be big enough. I guess I'm familiar with the fringed fleece that you divide a cage with so they can run through. Maybe some of the other members have ideas. Be aware that the only thing that truly fits (in *my* experience) under a lid is the 1X1 grid that fits in the corners and into the slots on the sides of the connectors. Everything else makes the lid fit unevenly, and it won't close all the way. Small plastic kid stools! The perfect hidey. Pigs can zoom through or hide under...and they are open on all 4 sides. And dishwasher safe! Thanks!!! I think I’ll try the stools. Sounds like a great idea. The stand is on the way!